My second set, as it’s my favourite Pokémon. I worked on making this set a bit more refined, and a bit more creative. Whilst the designs out there are superb, I wanted to push for more body shape differences then simply swapping the colours. Hopefully this will flesh out a more realistic Pokémon world a bit more. I have attached the text to the pictures and made them a bit more scientific, as people kept deleting the flavour text on tumblr. The Common Dragonite is the most plentiful and registered breed found to date. It is categorised by an equal balance of wingspan, limb size and tail size, being adapted for life both on the land and at sea for extended periods of time. It is also an incredible flyer, known to rise to great heights in order to circumnavigate the globe in a relatively short amount of time. In its common form, which can be found in lakes, rivers and other large bodies of water, Dragonite is a light orange colour, with teal membranes to its wings and yellowish antennae (which it uses to sense prey and also to perform electrical attacks). Dragonite reaches full maturity at 55 months if trained correctly, with wild specimens varying between 55 to 65 months. 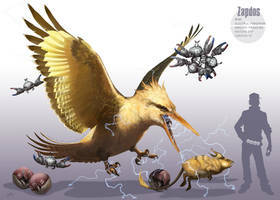 A creature with extreme intellect and power, it is not easily trained and is marked as a pseudo-legendary class Pokémon. The Eastern Blue Dragonite is found primarily in lakes and rivers and is noted for having very high special attack and special defence capabilities. Though smaller than their common counterparts, they are longer, more lithe and are considered the most elegant of the various breeds. They are not capable flyers, preferring to glide with their smaller wingspan, but are inclined to use them to surge out of bodies of water to catch prey. These Dragonite are the calmest and most serene of their species, boasting higher intelligence than the Common Dragonite. Along with their small wingspan and blueish colouring, they are easily spotted by their white frilled antennae that adorn the neck, leading people to mistake them for the juvenile Dragonairs that often accompany them in their pods. Being that they often live in warmer climates, they seem slightly more resilient to ice attacks (a primary weakness of dragons) as their blood is naturally warmer overall. The Crested Dragonite, sometimes called the Flame Crested Dragonite, is one of the most exotic breeds of this Pokémon. Its vibrant colours set it apart from other Dragonite, along with several other differences. As a cliff-dweller by nature, the Crested Dragonite has a much larger wingspan to body ratio than other Dragonite, capable of gliding for days at a time if required. Its feet are less webbed and have longer talons that allow it to pluck prey from the water. This also affords it more grip on its mountainous home. The crest fills with blood when the Pokémon is angered and shows off the same exotic colours that adorn the wing membranes. Crested Dragonite are often faster than common Dragonite, as their naturally larger wings allow for them to reach heights and speeds few other winged species can match. Their downfall, however, is when they are grounded, being lighter and more fragile than their Common brethren. The Muddy Dragonite is known for being the most aggressive of the Dragonite breeds. Far stronger and tougher than its ocean-dwelling brethren, the Muddy Dragonite boasts exceptional defence and attack, which it sacrifices speed for. As these creatures are often found with the ability ‘Multiscale’, (a highly sought after trait in the Dragonite species) it is no surprise that their tough, armoured hide separates them from the other breeds. Their wings are small and unsuited for long distance flights, preferring, as with other small-winged Dragonite, the use of quick bursts of speed in their swampy homes. Dwelling in murky and often shallow waters inland, the Muddy Dragonite can also be found lazing out in the afternoon sun, heating its body temperature up before it returns to the water. This breed is often used as parental stock in order to pass on the Multiscale gene onto its offspring, weeding out the aggressive tendencies as the process goes along. ‘Shiny’ Dragonite (and its evolutionary line) are rare, but are becoming increasingly more common, as are most ‘Shiny’ Pokémon. This pigment change, whilst adored by the training public, is in fact a genetic disorder resulting from inbreeding. All too often, trainers will ‘farm’ Pokémon eggs in order to create stronger and more specialised animals, sometimes resulting in a ‘Shiny’ side effect. The disorder, which can affect any Pokémon subjected to harsh inbreeding, can be categorised in a faint sheen on the skin (that can result in them being shunned from their social groups and parents and simply not surviving in the wild due to lack of camouflage in weaker animals) and a drastic skin colour change. Whilst considered desirable, most ‘Shiny’ Pokémon are often frail and sickly, few living as long as their uncorrupted counterparts. Pokémon breeders are advised by the government to halt this process, but with such a high demand for glamourous Pokémon, it is unlikely to stop any time soon. The Great Ocean Dragonite is exceptionally rare, typically spending most of their lives in the deeper areas of the ocean. Despite being rather sluggish and poorly equipped for combat on land, the Ocean Dragonite boasts remarkable defences and HP stats, with a thick hide that only the strongest attacks can penetrate. In comparison to the Common Dragonite, the Ocean Dragonite is far more suited to life in water. Its arms and legs are more fin-like, and primarily used for steering its massive body through the water. Its wings are too small for it to fly with, considering its weight, so they are commonly used for underwater battles, where quick bursts of speed are required. A large mouth also allows for it to swallow entire schools of Goldeen, Magikarp and other fish-like Pokémon in a single gulp. Seeing a fully grown Great Ocean Dragonite is a rare privilege. The largest known recording was at a Kanto lighthouse in 1998, where it was estimated to have been at least 30 meters long. Given that the Masuda Method is a thing that exists, the "shiny" mutation should actually be a sign of a LACK of inbreeding. If a population has more shiny pokemon that would be a sign that there is a healthy amount of gene flow and genetic diversity within said population. I love that last bit of information especially about the largest one. So that's what came to the Kanto Lighthouse! I love hearing about that giant Dragonite because as far as I've seen it's never been mentioned officially since then. Dude, I can't believe I never knew you did these! I love this The anime reference for the Great Ocean Dragonite was excellent. Hm, very nice. I'm considering writing a fanfiction about realistic pokemon and having multiple varieties of each, at least to an extent. Dragonite is definitely a fun one, because I kind of see it as an amphibious dragon, with Dratini and Dragonair being Caecilians (Amphibious Snakes) that grow into Dragonite, a mighty salamander dragon. Although I won't have any salt-water varieties, I wanted ones for lakes, rivers and swamps. Seeing this just makes me want to keep going with the idea, although I'm very inconsistent when it comes to writing, lol. How big is the Average Dragonite Supposed to be? Is the great ocean one a reference to the anime? I wonder, will you ever do more of these? It'd be quite interesting to see you do something based on that new Alola Dragon-type. 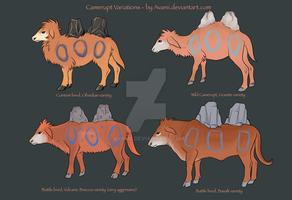 I love the idea of variations in Pokemon! I have truly never seen anything more creative than this. I'm so totally impressed. These are amazing. Great work as always. It'd be cool to read Bill's report of the rare Great Ocean Dragonite sighting. Awesome! I'd very much look forward to seeing it! By the way, love your work. All your stuff is amazing! Nah, I do best with what I got though. amusingly, shiny dratini was the second shiny (third if you count gyarados) I ever got and that was an hour or two after I got my first (second) shiny. An amazing job on all of them, I just can't pick a favorite. Someone else who adores Dragonite!!!!!!! YES! I love the reference to the Pokemon anime, it really connects well. Your realistic Pokemon art is jaw-dropping. Kudos on your skill! This is incredible. I love the idea of thinking of pokemon breeding in a more scientific way. Makes a lot of sense and totally makes me want to go to the pokemon world and become a biologist. You, sir, are my hero. Wow. I love them all! Amazing. I love the ocean one as well as the crested the most, the crested is lovely and I like how you attached the wings to his body. His wings make him look a bit more bat-like, like the bats that live in the caves nestled within the cliffs. definitely never understood the idea of breeding for shinies. shinies have absolutely nothing other than being, well, shiny. didn't use to be that way though. in gen two you were almost guaranteed to have a tough pokemon if it was shiny, as it was tied into what made pokemon strong in the game. but then they were seperated and the only point of having a shiny pokemon would be to just have an alt colored pokemon. then again it seems a little implausible that pokemon could suffer from inbreeding. the pokmeon gen pool is illogical as pokemon themselves. they can easily breed outside of their species, and it is always the mother specimen's species that is born. that seems ot imply that there is something unique to them that basically prevents major mutation, such as creating a hybrid. I love the nod to the anime in the Great Ocean variant! god i like the looks of these. EPİC atwork and presantation ! Really glad you like the designs! thank you! And ıts kinda hard to think Great Ocean Dragonite and Shinig Dragonite belong to same species; Biology and Adaptations ! An amazing work, indeed. I really like the choice to base Dragonite's design on something similar to an Axolotl, it fits perfectly with its evolutionary line since it's mostly based on aquatic creatures. Thank you! And it was a mash up of an axolotl and a frilled shark for the facial structure, glad you liked the end result! You're welcome I've always appreciated realistic pokémon design and detailed descriptions. Also, I'm an huge fan of Dragon-type Pokémon so there even more reasons to like this picture. Screw adding more pokemon to the games, Gamefreak should try doing this kind of design. There would probably be too many for the game to handle. unless they did a massive open world Kanto (possibly with just the first 151 as a test) the size of zelda U or skyrim haha! They do that and suddenly the Xbox and Playstation become distant memories. The last type of Dragonite reminds my pokemon episode, where Ash and others finds strange guy (anime version of Bill?) in lighthause.